Some people enjoy visits to the dentist. They love that clean, fresh feeling they receive from a good dental cleaning. They've often had great experiences with their dentist and probably have healthy teeth and gums. Other individuals are terrified to visit the dentist. This fear of the dentist often results from a poor experience and they sometimes feel too vulnerable lying back in a chair with someone else leaning over them. However, when you let your fear of dentistry interfere with keeping your teeth and gums healthy, you're not doing yourself any favors. This is exactly why sedation may be a great solution for you. Learn more about sedation dentistry and whether it's the right solution for you. Many people fear the vulnerability they feel when sitting in a dental chair. You can't see what the dentist is doing and you have little choice but to trust they have your best interest at heart. This fear often prevents people from visiting the dentist. That same fear may even prevent you from obtaining simple dental treatments (like a basic teeth cleaning). When you neglect your teeth and gums, you open yourself up to other health problems. Sedation therapy uses medications to help you relax and feel calm. As a result, your dentist can provide dental treatments without you panicking. During most sedation treatment options, the patient is fully alert. What Types of Sedative Drugs Are Commonly Used? Inhaled minimal sedation is a technical expression for the breathing in of nitrous oxide. Nitrous oxide is commonly referred to as "laughing gas." However, some patients have reported feeling weepy instead of happy. Your dentist will place a mask over your nose and you'll breathe in a combination of nitrous oxide and oxygen. The result is you feeling relaxed. Your dentist controls the quantity of the sedative you receive and the gas wears off quickly. In most cases, you can even drive yourself home after your dental treatment. The type of pill your dentist provides you will largely depend on the type of dosage you require. For minimal to moderate oral sedation, you'll most likely be given Halcion. Halcion is from the same drug family as Valium. Typically, you take the Halcion one hour before the procedure to fully relax your body. You'll find Halcion makes you drowsy, but you'll still be fully awake. You may be provided a larger dose if your dentist feels you'll benefit from a more moderate sedative. In this case, you may potentially be relaxed enough to fall asleep during your procedure. Most of the time, a gentle shaking will wake you up. After oral sedation treatment, it's wise to have someone drive you home as the effects of the drug won't have fully worn off yet. As IV indicates, this sedation treatment option involves receiving your sedative drugs intravenously. 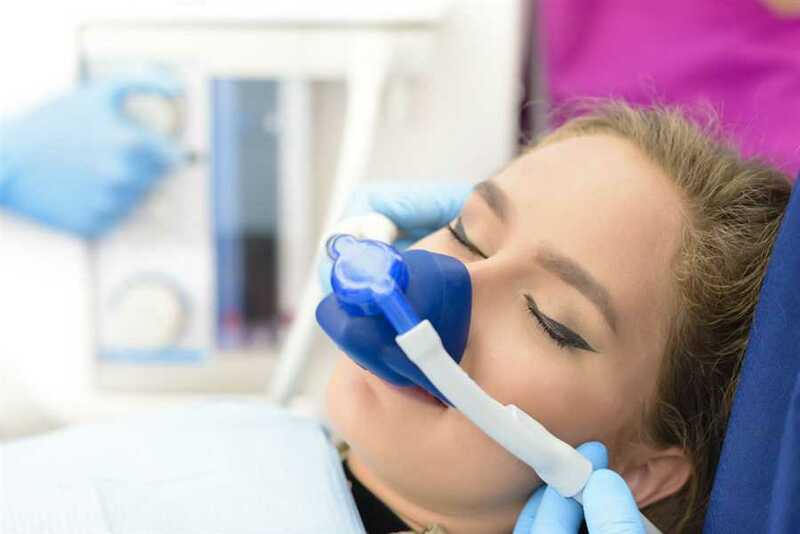 Not only will your sedative go to work more quickly, but your dentist can also adjust the level of sedation as needed during the entire procedure. After IV Sedation treatment, you'll definitely need a ride home. Deep sedation and general anesthesia are considered true sleep dentistry. During these sedation treatment options, you will receive a combination of medications to render you nearly or completely unconscious. You'll have no awareness of the procedure, but you'll also have to wait considerable time after the treatment until the anesthesia wears off and you can leave the office. Some people have adverse reactions to being under anesthesia and there's definitely more risk involved. There are always risks when drugs are involved (prescription drugs included). Even if a dentist or doctor is present, that doesn't mean something cannot go wrong. Before considering any type of sedation dentistry, it is wise to speak with your dental provider about all the risks involved. It is important to make sure you share any health limitations you may be facing with your dentist. Individuals with sleep apnea or those struggling with obesity are at a higher risk for developing complications due to the drugs. You will also want to remember to share any drugs or supplements you may be taking that could react adversely with the drugs your dentist provides to you. Even if you're 100% healthy and choose to use the most conservative sedative drugs, you could still face unexpected side effects. It is important to take your time after your dental procedure and make sure you feel well enough to travel before you leave the office. Speak up if something doesn't feel right! It is a good idea to check with your insurance company before you consider any type of sedation dentistry. In many cases, there is a good chance your insurance will not cover the sedative drugs. Most insurance companies won't cover the anesthesia, which can cost upwards of $800 for each visit. It's not uncommon to develop a phobia related to dental procedures. In fact, anyone who ever saw the movies "Marathon Man" or "Little Shop of Horrors" has probably developed a phobia. In a perfect world, all dentists would be properly trained and highly ethical. Unfortunately, not all dentists are proficient at their jobs or trustworthy. If you've experienced a bad dental treatment in the past, it most likely left a lasting impression. A negative dental visit experience makes it really challenging to have a desire to visit the dentist again and it's even more difficult to trust a medical professional. It's not uncommon for some people to feel more sensitivity in their mouth. When this occurs, you'll need more powerful drugs to help numb your gums. Some individuals are just resistant to local anesthetics. If traditional medicine isn't working and you need a root canal performed, you may require something stronger to help numb you. One of the easiest solutions to overcome dental anxiety is to find a dentist you trust. You might want to ask friends and family for a referral. You can also examine reviews and testimonials on dental providers online. Another simple solution is to request that your dental office talk with you about dental treatment options and help you deal with your fears. If the dental provider is willing to set aside extra time to make you feel comfortable, they're a good choice. A final suggestion may involve talking with a licensed therapist about your fears. There are additional alternative methods, aside from sedation. If you feel you're a good candidate for sedation dentistry or you have questions about how it works, we're here to help.